SHIP BOTTOM, N.J. - March 20, 2019 - PRLog -- Members of the Southern Ocean County Chamber of Commerce invite area professionals to take advantage of a variety of networking opportunities, chamber meetings and social activities geared to expand your business connections in the region. Celebrating their milestone 105th year, the organization is holding Thrive in 105 events with a Meet Me at the Chamber Happy Hour with Set the Bar at Chamber Visitor Center on April 17, May 8 Small Business Week Then & Now with Virtual Reality demo meeting, Summer Get Acquainted Party with free rides for members staff and their families on May 16 at Fantasy Island Amusement Park and the 105th Gala at Parker's Garage on June 12. The Chamber springs forward with plenty of free events starting with their first scheduled Spring Save the Date for April 10 After Hours at veteran owned business, The Drill Sergeant Cleaning Service in Ship Bottom with catering by The Local. The popular Women in Business scheduled at St Francis Center in April and The WooHoo in June. Non Profit Forum and Community resource planning are on the calendar along with the 3rd annual Hometown Security Seminar back this June in partnership the US Dept of Homeland Security. A special May After Hours Launch and Tour is set at Hotel LBI. 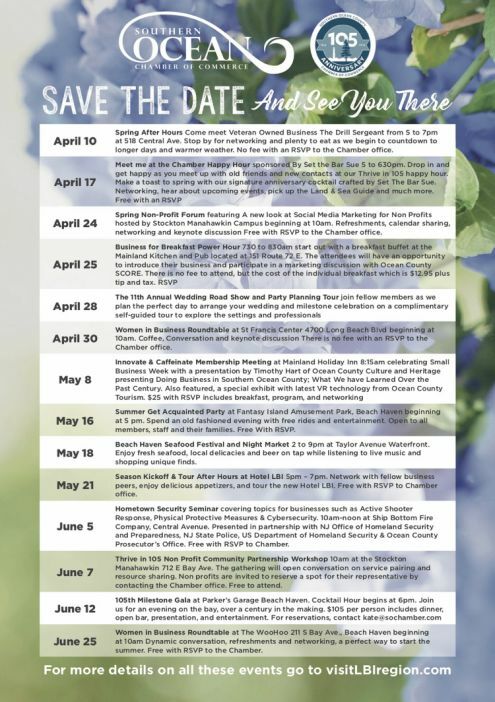 Chamber members also host consumer events such as April 28 Wedding Road Show & Party Planning Tour and Beach Haven Seafood Festival & Night Market this May.